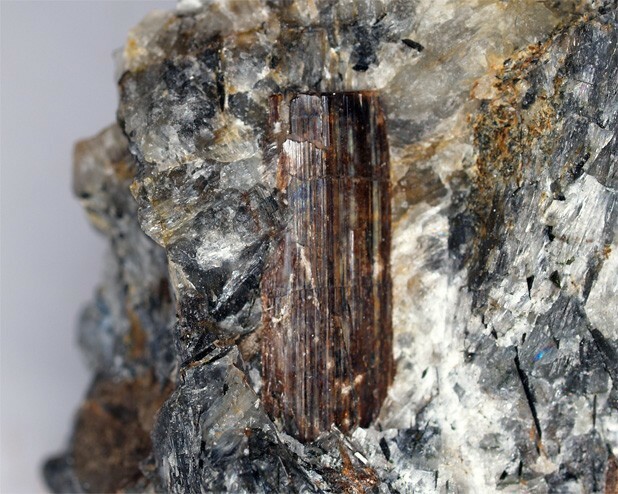 Shcherbakovite: Mineral information, data and localities. Named by E.M. Es'kova and M.E. 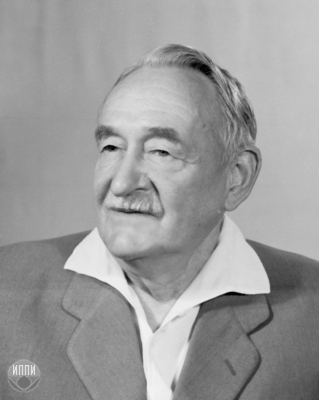 Kazakova in 1954 in honor of Dmitri Ivanovich Shcherbakov (13 January 1893 - 25 May 1966, Moscow, Russia) geochemist and mineralogist. Note: the "shcherbakovite" described by Mitchell (1990) is in fact noonkanbahite. Aegirine 2 photos of Shcherbakovite associated with Aegirine on mindat.org. 65.3.4.3 Ohmilite Sr3(Ti,Fe3+)(Si4O12)(O,OH) · 2-3H2O Mon. Es'kova, E.M., Kazakova, M.E. (1954) Shcherbakovite - a new mineral. Doklady Akademii Nauk SSSR: 99: 837-840. Fleischer, M. (1955) New mineral names. American Mineralogist: 40: 787-788. Mitchell, R.H. (1990) Mineralogical Magazine: 54: 645-646. Uvarova, Y.A., Sokolova, E., Hawthorne, F.C., Liferovich, R.P., Mitchell, R.H. (2003) The crystal chemistry of shcherbakovite from the Khibina massif, Kola Peninsula, Russia. The Canadian Mineralogist: 41: 1193-1201. Jambor, J.L., Roberts, A.C. (2004) New mineral names. American Mineralogist: 89: 1826-1834. Krivovichev, S.V., Yakovenchuk, V.N., Pakhomovsky, Y.A. (2004) Topology and symmetry of titanosilicate framework in the crystal structure of shcherbakovite, Na(K,Ba)2(Ti,Nb)2[Si4O12]. 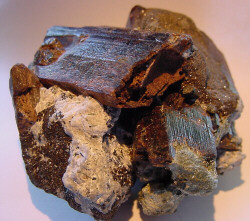 Zapiski Vserossijskogo Mineralogicheskogo Obshchestva: 133: 55-63. Piilonen, P.C., Ercit, T.S., Roberts, A.C. (2005) New mineral names. American Mineralogist: 90: 768-773. The following Shcherbakovite specimens are currently listed for sale on minfind.com. Pekov, I. (1998) Minerals First discovered on the territory of the former Soviet Union 369p. Ocean Pictures, Moscow; Khomyakov, A. P., Pushcharovskiy, D. Y., & Ronsbo, J. G. (1983). 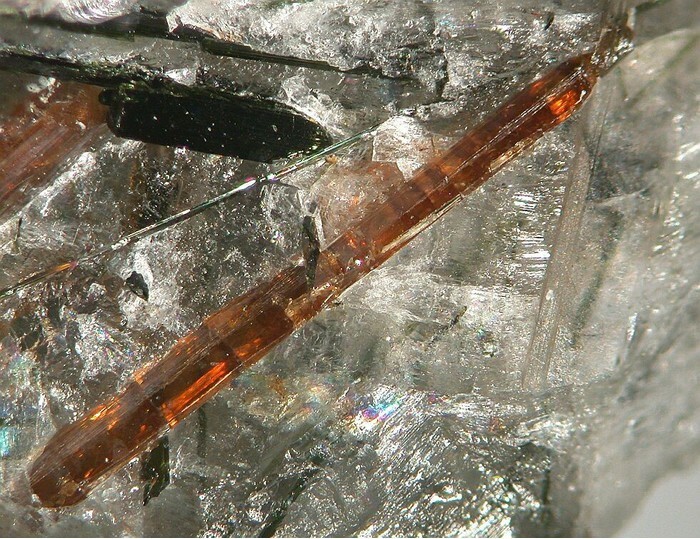 Clinophosinaite, Na3CaPSiO7, a new mineral. International Geology Review, 25(6), 731-734. Moiseev, M.M., and Chukanov, N.V. (2007): New Data on Minerals 41, 46–55.